Let’s explain what each element means: D is the Dirac matrix, which contains the information about the interaction between the quarks and the gluons; b is the source, which tells us where we put the quark at the beginning; and x is the propagator, what we want to compute. Naively, one would have the temptation to solve this problem by just doing x=D-1 b. But if I tell you that the Dirac matrix is usually a 108 x 108 matrix with a lot of elements equal to zero (sparse matrix), computing the inverse is not an easy step (almost impossible). There are multiple methods that can handle this type of matrices (BiCGStab, GMRES, …), but the one that we are interested in is the multigrid method. Schematic representation of the multigrid method. Start with an initial guess of the solution, and do a few steps of the iterative solver on the fine grid (called pre-smoothing). Project this solution to a coarser grid, use it as an initial guess, and solve the coarser system (should be easy). Project it back to the original grid, and do some steps of the iterative solver (called post-smoothing). Mass scaling of diferent methods, comparing the time it takes to compute a propagator . Looking at the plot, as we decrease the mass of the quarks (x-axis), the time it takes to solve increases (the y-axis is logarithmic! ), but compared to the other methods, the multigrid (the one labelled as DD-αAMG) is always the fastest one, in particular at lower values of the quark masses (the physical values for the up quark is labelled as mu, and for the down quark is md). So, if the multigrid method is already fast, what can I do to make it even faster? The solution is pretty simple, and it’s the main purpose of my project: instead of solving the linear system for one b at a time, solve it for multiple b‘s at the same time. And how is it done? You’ll have to wait for the next blog post to learn about vectorization, which consists, in a nutshell, in making the CPU apply the same operation simultaneously to more than one element of an array. Cool, right? A. Frommer, K. Kahl, S. Krieg, B. Leder and M. Rottmann. “Adaptive Aggregation Based Domain Decomposition Multigrid for the Lattice Wilson Dirac Operator“. SIAM J. Sci. Comput. 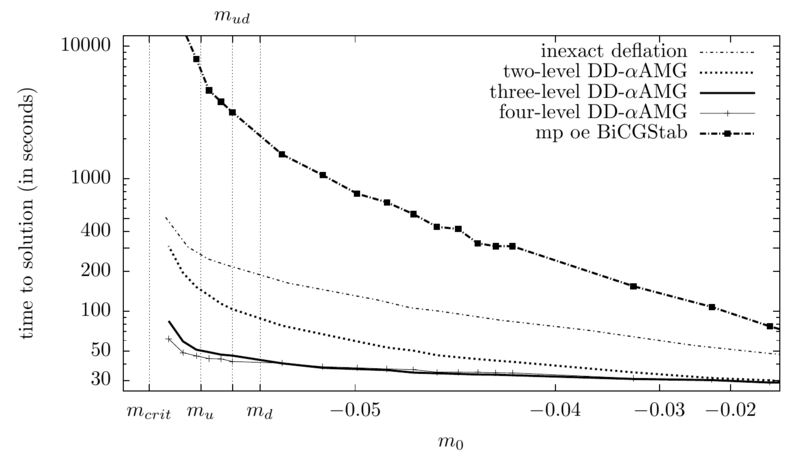 94, A1581 (2014) [arxiv:1303.1377 [hep-lat]].